I decided that my 'slightly less masculine' Spring layout was going to be a bit of a style experiment. Does it work? As a layout concept, probably not. But I'll definitely revisit some of these techniques - just not all at once! Besides, it's much more fun to take an idea rather than just duplicate a layout, eh? In the top right corner, by placing the stick-on transfer over and within the photo, I tried to create the effect of a field of bluebells viewed from the tranquil setting of a gazebo. My spring page kit provided the framing I wanted. The lattice work was very tricky until I found that by gluing the ends of half the strips to the reverse side of the stick-on 'gate' I could then simply slide the other half of them along - alternating 'over' and 'under'. My Craftee cutter quickly gave me all the strips I could possibly want. The daffodil framing of one of my photos could be worth a rerun one day. (It IS six petals. I checked) Although my petals are overly dominating the photo, this type of framing can give you great flexibility with the final size and shape of your photo image. I'd seen this 'squaring effect' in the excellent 'Scrapbook Inspirations', used on a highly colourful underwater photograph. My crocus offering was not perhaps as spectacular as shoals of fish swimming past a coral reef. 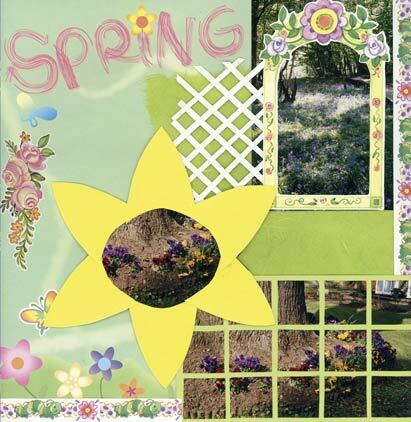 But, hey, this was supposed to be a Spring scrapbook layout, so there!